Alse Young, the first person to be tried, convicted and put to death as a witch on U.S. soil, was executed by hanging in Hartford, Connecticut on May 26, 1647. The Hartford Witch Hunts occurred more than four decades before the infamous Salem Trials of Salem, Massachusetts. Windsor, Connecticut, Alse’s hometown, is located in the Farmington River Valley, about 15 miles from the location of the Fifth North American Systemic Constellations Intensive. Prior to the Intensive, I had never heard of the Hartford Witch Hunts or Alse. However, given the flow of the Constellations and surrounding energy at the Intensive, upon returning home, I had a strong inclination to research Connecticut’s history regarding witch hunts and executions. I found Alse. I had the privilege of organizing the Fifth North American Systemic Constellations Intensive and the honor of serving as a faculty member at the July 2012 event. The Intensive, held in Farmington, Connecticut, USA, was a four day residential opportunity for participants to immerse themselves in the learning and practice of Systemic Constellations Work. The group that gathered included many seasoned Constellations professionals from around the globe as well as participants who were new to this work. The sold out event proved to be a rich experience for participants and faculty alike. But, Alse had not been included. …the Colonies of Connecticut actively brought numerous suspected witches to trial, and in fact had the first recorded hanging of a witch in New England in 1647: a Windsor woman named Alse Young. Little is known about her, but thirty years after Young was executed, her daughter Alse Young Beamon was likewise accused of witchcraft in Springfield, MA. What is clear from the Colonial records, according to State historian Walt Woodward, is that the Connecticut and New Haven Colonies did not hesitate to prosecute accused witches. In fact, between 1647 and 1655 [according to Woodward] ‘every single person tried and found guilty [of witchcraft] was executed.’ In a 21 year period in the colonies of Connecticut (1647 to 1668), it is believed that at least 29 people were indicted for witchcraft and 11 were condemned and put to death. Like many similar cases of witchcraft, Alse Young was a woman without a son when the accusation was lodged, which implied that she would be eligible to receive through inheritance her husband’s estate. It is ironic that I had never heard of Alse or the Hartford Witch Hunt. Throughout my thirty five years of professional life as a social worker, community organizer and psychotherpist, I have been a student and teacher of trangenerational trauma and its specific relationship to the ongoing poverty and violence suffered by women and children. This study and practice led to a deep exploration of the hidden history and voices of women within the wisdom schools of ancient cultures where women had value, cultural leadership and where the balance between the sexes existed. Yet, I had never heard of Alse. History shows colonial married women arriving to their homes in “The New World” unable to hold property (even their own clothes), conduct business or hold any parental rights. Children along with their mothers were the sole property of their fathers or husbands. This is a history that all of our Euro-descendant grandmothers share; a truth that is in the ancestral fields. Many of the women were actually white slaves sold from Ireland, France and other European countries. Many women and men arrived to the colonies as indentured servants; slaves in the truest sense, but able to buy their eventual freedom if they could survive the harsh conditions of their lives. The culture was held within the religious, social structures of Puritan Protestant and Catholic Christianity. The Catholic Church created structures from Biblical verses to propel the Witch Hunts in Europe; reported even before the Medieval Inquisition of the 12th–14th Centuries. The structures severely oppressed women in all forms of public and personal daily life and most specifically in the realms of feminine properties of spirituality and wisdom as healers. Often it was the prosperous woman who was accused and killed as the Church or accusing neighbors assumed her property. The priestesses, the druids, the ancient rites were all but destroyed as earth based or pagan rites of Europe were named heretical, outlawed and punishable by death. Puritanical Protestants followed suit. The New England settlers carried the ancestral legacy of the European witch hunts and the destruction of the European earth based religions to their new homes and work of colonization. None the less, the ancient European indigenous rites and truths are retained in the fabric of the Christian Church; both Catholic and Protestant. Yet, there we were, cared for so sweetly by our Catholic hostesses at the Our Lady of the Calvary Retreat Center. We were held in the container of the feminine manifestation of the Catholic Church. Along with researching the witch hunts, I felt compelled to discover more about this particular order of Sisters. 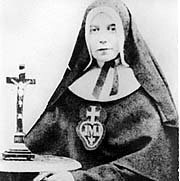 The foundress of The Sisters of the Cross and Passion, Elizabeth Prout, suffered her own inquisition. She created this order with the mission of caring for the poverty ridden women and children suffering within the grips of the European Industrial Revolution.This was a radical departure from the established Religious Orders of the mid-1800’s. Some, loud in their denunciation, called for the Institute to be suppressed. To settle the matter Bishop Turner, in July 1858, set up a Diocesan Enquiry to examine the Charges against the Sisters. All aspects of their life and works were scrutinised…The Charges were examined… and quashed… Elizabeth personally and all the Sisters were exonerated. Their opponents were defeated…and they didn’t like it. After the Enquiry the Sisters had to tread warily maintaining “humble silence”, waiting for the tide to turn in their favour. Throughout my professional life I have been a student and observer of the significance of both place and time as related to the transmission of trangenerational trauma. Within the study of trangenerational family theory, it is not an unfamiliar concept that the history of land, place and time can effect the events of the descendants and the entire communities where past traumas occurred. My experiences, prior to, during and following the Intensive validated that premise in a very vivid and precise manner. The very heart of Systemic Constellations Work is to explore hidden dynamics in an effort to move toward healing, on the macro, mezzo and micro levels of existence, from transgenerational traumas. We find the North American Systemic Constellations Intensive sitting on the land holding the legacy of Alse. The Sisters of the Cross and Passion are our hostesses. Many of the participants at the Intensive are the descendants of the early settlers with Puritan ancestors, most are of European descent, white and of relative “privileged” standing. Could there be any place or people more deeply seeded with the ancestral knowing needed for this healing work to bloom? During my research, I became aware of significant correlations as it relates to time. The Fifth North American Intensive was held in the month of July. As previously noted, The Sisters of the Cross and Passion website states, “… Bishop Turner, in July 1858, set up a Diocesan Enquiry to examine the Charges against the Sisters.” Certainly July is a significant time for this order of Sisters and their foundress, Elizabeth Prout. On both a mezzo and micro level, the results of the July enquiry determined the Sisters’ capacity to work; in short, their capacity to even exist. How fitting that the Intensive would enter this work within the month of the anniversary of the Diocesan Enquiry of the Sisters. It is also worth noting that the anniversary date of Alse’s execution is May 26. In 1971, the U.S. Congress designated the last Monday of May as Memorial Day, a national holiday. The history of Memorial Day stems back to the mid 1860’s as a desire to offer a day of recognition to the fallen soldiers of the Civil War. Over the years, the day has expanded to include all people who lost their lives to war. Today, many view it as a day to remember all deceased. As such, the entire last weekend of May has become known as “Memorial Day Weekend” frequently containing the date of May 26th. On the date of this writing, the anniversary of Alse’s execution falls on the Sunday of Memorial Day Weekend. It can be safely assumed that Alse and the memory of the people who lost their lives during the Colonial witch hunts - a different kind of “warfare” - were not intended to be included among the remembered ones. In fact, one might smile a little at the “macro-magic” at play here. Despite lacking prior knowledge of Alse Young or Elizabeth Prout, when planning for the Intensive, I felt strongly led to present a workshop titled “The Hidden Field of Women.” I also felt deep anxiety in doing so. Would my work specific to this issue be considered “to exclude men”, “a threat to the status quo” and deemed as “having no value?” Where did those fears come from? None the less, my intention and commitment were to offer the opportunity for us to experience, truly include, our silenced grandmothers. My intent was to give our grandmothers a place where they are often lost under the field of the collective experience of a patriarchal culture. In preparation, I took time to refresh my knowledge about the lives of 17th-19th century women of European descent, particularly regarding how their lives entwined with the First Nations People, slavery and the antislavery movement. Still, prior to the Intensive, I did not stumble upon any information about the Hartford Witch Hunts or think to explore the history of the Sisters of the Cross and Passion. None the less, the Constellations I had the honor to facilitate moved with the field; building and supporting each other as Constellations often do. They revealed the pain of silenced, oppressed, displaced women and the impact on the witnessing men. They revealed how strongly these experiences still resonate. They revealed the healing paths containing strength, courage, wisdom and peace. Each day, the Constellations that unfolded offered questions and then answers and moved from one level of awareness and healing to the next. One might ponder if opening the Intensive using the Celtic Medicine Wheel in a Catholic facility fully opened the ancestral fields of European descent at its indigenous roots. Did doing so offer the invitation to the archetypal Alse to find a place at the Intensive? Did the religious leaders who had put her and others to death show up? Did the radically compassionate energy of Elizabeth Prout enter our field? Do we find the few remaining First Nations People standing in silent witness of the white woman’s murder even as their own people are displaced from their homes? We witnessed the slow reconnection of the client with her silenced mothers and collapsed fathers in her ancestral field. Just as energy and connections were being established, the exploitative and destructive power of the one who claims privilege and entitlement exploded through the Constellation. Moving from past to present, he had full awareness of the destruction in his wake with absolutely no desire to do anything differently. He offered no need to reconcile the past or change his behavior in the present. He was content to stay cemented in his illusion of Entitlement. As a result of his imposing presence, The Constellation concluded with the ancestors returning and remaining in their silence; ancestors and client returning to their disconnected state. It offered a perfect snap shot of the very purposeful American Amnesia held by his descendants. As much as my sensibilities and human desires cried out for a different “resolution” perhaps it is just true that this really is the current state of the collective. How do we see and acknowledge this father of patriarchy while not being blinded to all that stands, or rather collapses, in the field he moves through; past and present? If we find ourselves as the descendants of the privileged, what responsibility do we have in the wake of our father’s destruction as it continues in its exploitation and patterns of exclusion? Do we dare see our silenced grandmothers and collapsed grandfathers of the past? Do we allow ourselves to see only the strength and power of our “entitled” father and take refuge in our chosen amnesia to enable us to maintain our own privilege – like him? Moving through seven generations, the client finds the mother (7th generation) who feels and looks “crazy”. The mother deeply mourns the loss and death of her daughter (6th generation); lifting her daughter’s soul to the Heavens. The daughter (6th generation) reports she has been strangled - the representative as well as others (including myself) feel the “snap.” The quick pain in our necks, the “snap,” resonates as one might imagine a hanging would feel. The “craziness” lifts as truth of historical context is uncovered. The lineage heals through finding they are not crazy in their responses to denied oppression. No longer do they need to silence their daughters to keep them safe or feel crazy from the religious cognitive dissonance where the only hope is to release them into the spiritual bliss of death to escape the torture of life. The lineage sheds the false accusation of being crazy and finds courage and permission to use voice and honor one’s own “knowing”. The authority and blessings flow down seven generations of women to the current client. Thank you to the solitary man who held the place; first as a father and then after the Constellation, as witness as the women moved through body movements to release the energies they held as representatives as well as the energies that resonate within their own family fields. We found the healing that only women can provide to women and claimed the space and time to do the work that is only ours to do. Day 3: The Hidden Field of Women; Moving Deeply into Sacred Space. On the final day, I was to offer a Special Topics workshop. As previously mentioned, I intended to offer a workshop titled, “The Hidden Field of Women.” My original format was to include some historical information prior to beginning the Constellation Work. The Field had other plans. One of the women in the group was in psychic pain feeling she had picked up energy that was not hers during the Opening Gathering that had just occurred. During the Gathering, we had engaged in a meditative practice allowing our sadness and grief for the dead to surface. As a result, this participant needed assistance at the conclusion of the Opening Gathering. She felt strongly that this particular workshop was the place where her needs could be attended. I had no idea if her pain and field would have anything what so ever to do with the specific topic of the history of women. None the less, given her clear need, the group and I were willing to move into the field as she needed. No further discussion was held. No client interview occurred. The woman seeking assistance was simply asked to stand in the middle of the space. Each participant was invited to take her/his place. The Constellation unfolded in its own organic perfect movement. It became an open field revealing the many aspects of the Spirituality of Women. We found the voices of Knowledge, Nature Wisdom, the Sacrificed One, the One Who Holds the Grief, Mother of Christ, The One Who Holds the Container as well as others. The multifaceted elements of Feminine Spirituality organically moved as each discovered the right place to support and create a cohesive whole. It also revealed the Masculine who could stand in silent witness to the Feminine as well as the Masculine who sat in the circle with the women; perhaps the son, who sees, suffers and mourns. Thank you to the two men who selected this workshop. You are deeply needed in such spaces. The Constellation ended with the One Who Holds the Grief gagging and feeling sick, working on clearing her body of the toxic accumulation. All of the other representatives stood in support and attendance of this one. The clearing would be a long process and all just knew that was true. Each of us can reconnect to our spiritual wholeness and attend our grief with gentle patience and honor. The Hidden Field of Women sits within the truth of the Spirituality of the Feminine, the very origin of the oppression of women. Twenty percent of those killed as witches were men. In many instances, the men were the partners, protectors or supporters of the Mysteries. Perhaps it is in this field that the healing can be found; for both women and men… and all of the children. Perhaps the grief can be cleared. In writing this, I honor Alse Young and Elizabeth Prout. I honor all of us, women and men, whose legacy is still impacted and informed by the untold stories and hidden field of our silenced grandmothers and collapsed grandfathers. I was awed by the wisdom of the Field as it provided the beautiful progression of the Feminine Voice and the respect and support of the Masculine so needed in this work. There is a reason we so often find our grandmothers and mothers silent, slumped and turned toward the generations behind them in Constellations. The wise woman who dares to speak the truth shows up when we invite her; but not before. She knows that if she shows up with unwelcomed truth, she will just be “burned” again… silenced, even within a Constellation. She can wait. None the less, even without knowing her name directly, the strong feminine energy finds its way into our collective work. She was welcomed by some of us and maybe, more importantly, needed by all of us. I am grateful that I did not have prior knowledge of Alse and Elizabeth. It enabled me to fully witness and experience the wisdom of this Field beyond my own “rational knowledge.” It was the phenomenological experience: the strong feminine energy that was ever present, the fear that I felt in opening this field and the disquiet that the participant felt after our morning opening that led me to this research upon my return home. Finally, I found Alse, Elizabeth and the others. The information was, of course, easily and readily available and provided with exact perfect timing. It is clear that the “Witch Fire” is still stoked in our present day; in some countries, very directly. In other countries, the fire burns in more subtle ways revealed in the critical condition of our Earth, and the dire global suffering of women and children. I honor the Sisters of the Cross and Passion who continue their work recognizing, “The challenges of yesterday are still the challenges of today but on a global scale.” Our collective wounds are great. Does the Puritanical Father bless his Entitled Children to continue in his destructive power in honor of him and for benefit to themselves? Do the “less entitled” descendants of the Father remain silent for fear of being hanged themselves? Do we propagate these entanglements in our work and in our professional process as Constellations facilitators? Can we move beyond our own limited scope of awareness as the practice and evolution of Systemic Constellations Work unfolds? As we ponder these questions, our own grandmothers, who shared Alse’s experience as well as Elizabeth’s, provide us with the knowing we need when we find ourselves still in the midst of the collective fire. This transformation can be our true legacy; the life force gifted to us out of the screaming silence of our Grandmothers. In my closing statements to the group at the Intensive, I concluded with the quote, “We teach what we need to learn.” I then added, “…and we learn what we need to teach.” I thank all of my ancestors, grandmothers and grandfathers, for giving me permission to claim my own authority, clarity, and voice… to embrace this learning; this life. With our Grandmothers’ Blessings, we have the power and freedom to transform the Witch Fires of Death into the Fires of the Alchemist.